One of my best adventures of all time was an amazing trek through three uniquely awesome countries in the Northern Atlantic – Iceland, Greenland, and the Faroe Islands. While I intend to write more about these destinations separately, in the meantime I thought I’d share a glimpse into one of these amazing spots. I took this photo of the famous waterfall, Gullfoss (meaning “Golden Falls”). It is one of the top tourist attractions in Iceland and is really amazing to behold. The water rushes down a rock staircase before dropping into a deep crevice. Note the people on standing on the overlook to the right of the photo to get a sense of the scale. 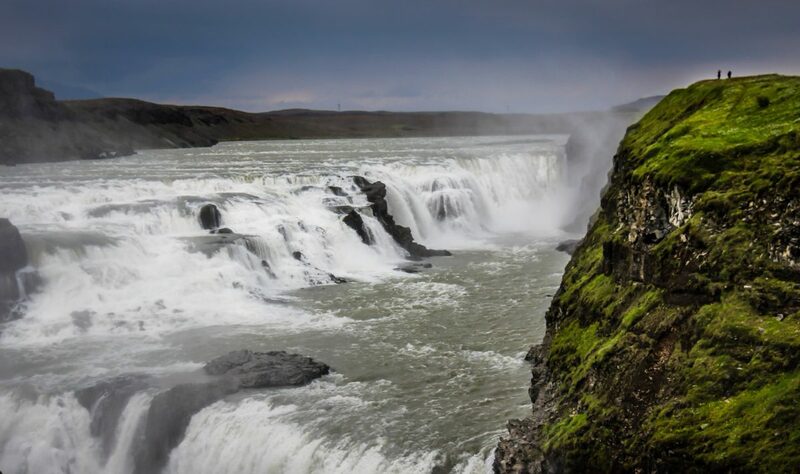 Gullfoss, Þingvellir National Park, and the geysirs of Haukadalur comprise the popular tourist sightseeing triad known as the Golden Circle. Park in the main lot and then get ready for a short but stunning walk down to the waterfall. You’ll hear it before you see it which only enhances its first (and lasting) impression. I loved every waterfall I saw in Iceland, but I can see why this is a favorite of people everywhere.